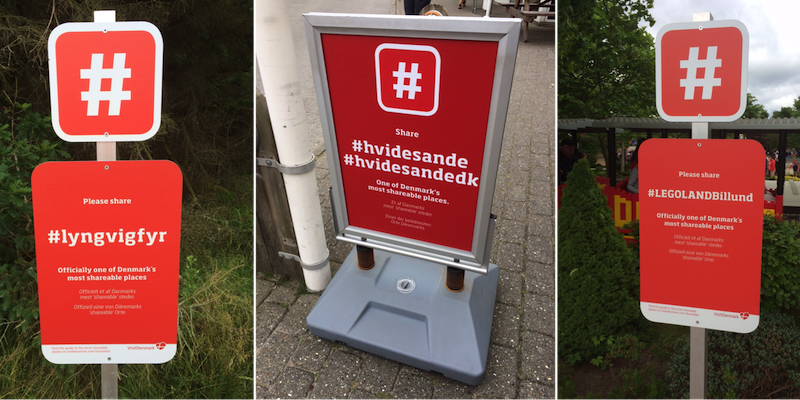 As I visited a number of tourist attractions I started spotting this sign which used the ubiquitous hashtag icon and asks people simply to “share” their experience. The use of the hashtag on its own really catches the eye, plus it plays off the look of the Danish flag, which is a clever touch. Having the same style of sign in each location effectively makes it into a “format” (readers of this blog know I love a good format!, oh yes). Once you’ve seen a couple you start to look out for them. It’s very clear what the sign is asking visitors to do which is great. But what I particularly like is that it doesn’t try to be too prescriptive. It’s not trying to make you download some app or leave comments on a specific social network page… just use the hashtag to share your experience. That’s it. By focusing on the action, rather than specific social network pages it also helps limit frustrations when social networks go out of favour or change their logos, for example. I don’t expect hashtags to disappear anytime soon. You can read more about the campaign on the Visit Denmark site. Have you seen any similar examples in the UK? Please tell us about them in the comments below.